Memorial Day Weekend – Kalamazoo Tourney “Pickleball Fever in the Zoo” – Pickleball is Thriving in Northwest Ohio! Happy & Healthy New Year wishes to you all! As the new year starts, I am sure many of you are thinking and preparing for this year’s many Pickleball tournaments. Each year it seems like there are more and more tournaments and thankfully for us, there are many in the local MI/OH area. I wanted to send out a note on one that I think is going to be top-notch. 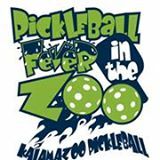 “Pickleball Fever in the Zoo” will be held in Kalamazoo MI over the Memorial Day weekend. This tournament is a memorial tournament to honor the late Bob Northrop who was instrumental in growing the sport in the Kalamazoo area and who was also responsible for introducing Jim and Yvonne Hackenberg to the game. Jim and Yvonne will be the directors for this tournament and are really putting a lot of effort into making this an outstanding tournament and one that you won’t want to miss. This is a double elimination skill level tournament with events for Mixed Doubles, Men’s Doubles and Women’s Doubles. There will be limited space so please consider registering early. The trip over to Kzoo is an easy two-hour drive from the Toledo area. Looking forward to seeing you all on the courts soon! This entry was posted in Play Pickleball and tagged Jim & Yvonne Hackenberg, Kalamzooo, memorial tournament, pickleball, toledo pickleball, Yvonne Hackenberg. Bookmark the permalink. I tried to register this morning for the Memorial Day tournament in Kalamazoo. I almost completed my registration, but lost the site when I was about to pay. Now, I cannot get back in the registration, because it is not displaying for me. Can someone call me to complete (process payment) my registration. Also, my partner, Tom Angelos, is going to register soon.